Josephine Zhao remains on the ballot. But can she win? On Monday morning, embattled school board candidate Josephine Zhao dropped out of the race — a move that came after scads of her own troubling statements were revealed on this site and others. These statements, Mission Local is told, led her high-level supporters to counsel her to abdicate. But while Zhao, via a Sept. 10 Facebook post, stated she has “decided to withdraw” from the race, it remains unclear exactly what that means. The final day to officially remove herself from November’s ballot came and went on Aug. 31 and the ballot has, in fact, gone to the printer. This, legal observers tell us, renders it highly unlikely that a judge would ever demand Zhao’s name be stricken. So, “withdrawn” or not, Zhao — far and away the top fund-raiser in the field — will all but certainly be on the ballot. And if she finishes in the top three among the 19 aspiring Board of Education members, she’s in. Zhao did not return our e-mails or text messages inquiring whether she would refuse to serve if elected. Mission Local asked every elected official endorsing her what they had to say about this. None of them have bothered to un-endorse her, and none would speak to us on the record. Off the record, however, none saw a need to urge voters not to vote for Zhao or urge her to not serve if elected. That’s because her election is now viewed as unlikely — and to weigh in further would be seen as piling on during an emotionally fraught time. Just how unlikely Zhao’s election would be, however, is not a settled argument. In the Chinese-language press, SingTao Daily described her as being pressured out of the race by the gay community. Her withdrawal was covered in a brief, inside article in the World Journal — meaning Chinese-language readers could potentially either be incensed about Zhao’s “withdrawal” or miss the story altogether. Jim Ross, the consultant who ran Gavin Newsom’s successful 2003 mayoral run and has handled many citywide races since, agreed in part. And that was the take Zhao’s supporters were relying on to avoid having to further publicly weigh in on the matter. Longtime San Francisco politicos, however, saw this as an easy out for them to avoid severing ties with a woman who has, in the past, proven to be a loyal and useful ally for political moderates — and could be again. 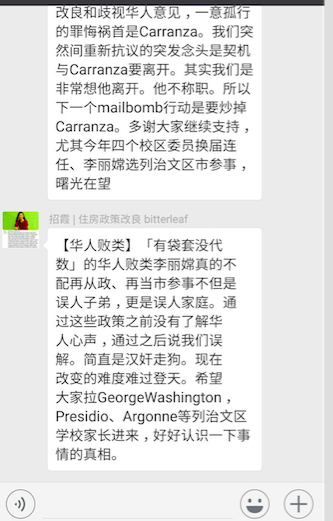 As noted in Mission Local’s earlier articles, during Sandra Lee Fewer’s 2016 supervisorial race vs. Marjan Philhour, Zhao wrote private, Chinese-language messages to her extensive follower lists decrying Fewer as a “race-traitor” and “Chinese trash.” During Jane Kim’s 2016 state senate contest vs. Scott Wiener, Zhao denounced Kim as a “homewrecker,” while recruiting hundreds of Chinese speakers to wave placards or knock on doors for Wiener for $100 to $125 a day. Last month, however, Zhao wrote to her Chinese-language supporters that her opponents in the school board race included “two transgender candidates … fighting for the title of ‘first transgender commissioner’ … There are also three homosexuals. Their highest priority for education would be to spread ideologies.” She also communicated to her core supporters that she’d be sending different messages in Chinese and English, and that they should know better than to take the answers she provided to English-language questionnaires seriously. This proved too much, and Zhao was counseled out of the race. But this was done with a gentle hand — and, city political observers note, her ability to serve as a valuable political asset in swaths of the Chinese-language community remains intact. Just how many votes it’ll take to win one of the three top spots in a citywide school board election is a matter of conjecture. In 2016, top finisher Matt Haney netted nearly 176,000 votes, and fourth-place finisher Rachel Norton made the Board of Education with 129,012 votes. But in non-presidential years, it has required far fewer votes to succeed. In 2014, Emily Murase’s 80,877 topped the field, and Hydra Mendoza’s tally of 52,998 was enough to earn a seat. Four years earlier, Murase came third with 68,853 votes. None of these contests, however, featured a massive, 19-candidate field — nor the oddity of no incumbents running. Even viable candidates told us they had no sure idea how many votes they require to clear the hurdle — and they considered Zhao still in play. “Any candidate who seriously intends to withdraw would reach out to the press with an explanatory statement, put a statement on their website, and make sure their endorsers knew of their intentions,” sums up Erwin. Zhao’s website has posted the same “withdrawal” statement made on Facebook, but, as of press time, featured a full list of endorsements and what appeared to be a functioning donations page. The endorsers we spoke with do not know her intentions. What a Sham. All the electeds who endorsed Zhao are Downtown Democrats, and the real reason they have not formally withdrawn those endorsements is they very much hope to secure the long-term support of the significant number of more conservative Chinese American voters for their agendas. So politely sweeping a ‘little bit of gay bashing’ under the rug rather than “piling on during an emotionally fraught time” is their transparent excuse to continue to build such an alliance with the reactionary elements of that community. they’d rather empower the Right in SF than see real Progressives advance their Social Justice agenda. Uhh…Lucca Brasi was the hit man in The Godfather movie. The well known line referred to his fate as “sleeping with the fishes”. As for Zhao, that large pile of money isn’t going to be returned to the donors. It will be spent on campaigning. But quietly, and only within the Chinese community that her backers want to capture for other elections. That $125 sign wavers will appear again in Nov. I wouldn’t put it past her to directly buy votes with cash in red envelopes. She clearly disdains ethics applying to political campaigns. She’s the most egregious and unapologetic identity SF candidate I’ve seen of late. Zhao is angling and being groomed as successor to Rose Pak. Except unlike Pak, Zhao isn’t primarily concerned with the welfare of the Chinatown community. She’s serving herself and her ambition. More dragon lady than Pak. Yes, she is being hounded out of the race. This is a One-Party town and we don’t condone dissent. Citing her opposition to AB1266 (2013) as being ‘proof’ that she is still maintains anti-transgender positions isn’t v convincing, alongside her admission that ‘mistakes were made’. And while I have no problem with gender-neutral single bathrooms, I do question multi-stall toilets, and think gender-neutral locker rooms are a stretch.